Located north of Ari Atoll, Nika Island Resort & Spa offers you a prized partition of paradise in the tropics that will seduce you with the quality and professionalism of its services while being in the middle of a natural sanctuary - hardly believable! A dream place for families, couples, and groups of friends. The 43 rooms and villas, combining luxury and comfort, nestled in lush vegetation or on stilts, are a haven of peace. Discover the benefits of an idyllic stay on an island surrounded by an exceptional reef. 3 Nights Garden Room - 35 sq.m. 3 Nights Beach Villa - 75 sq.m. 3 Nights Water Villa - 75 sq.m. 4 Nights Garden Room - 35 sq.m. 4 Nights Beach Villa - 75 sq.m. 4 Nights Water Villa - 75 sq.m. One of the most beautiful Maldivian islands and is perfectly suited for honeymooners, the Nika Island is among those that offer travelers a luxurious stay, all in an idyllic setting on a paradise island. It is one of the most beautiful islands of the Maldives with its fine powdery sand and bordered by crystal clear turquoise water. Indeed, to enhance your stay on the island, you can find almost everything you need, both in activity and services. Escape to the middle of the Indian Ocean, in the tropical paradise of the Maldives, and marvel at coral sand beaches, crystalline blue lagoons and multicoloured reefs that host extraordinary aquatic ecosystems around 1000 islands. Just 20 minutes by seaplane from Malé International Airport, take a seat on the private island of Kudafolhudhoo. Enter the beautiful 5-star Nika Island Resort & Spa Maldives. Enjoy access to your private beach or pontoon from your pied-à-terre or dream in the heart of the tropical vegetation that offers freshness and exotic scent to your room. 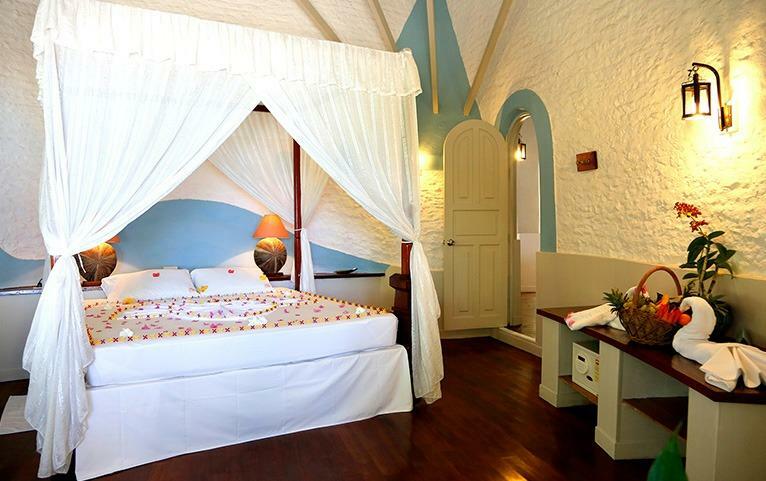 The hotel consists of small, traditional Maldivian-style villas set in extensive gardens to ensure your privacy. The 44 villas have a modern and inventive theme creating a unique "cocooning" atmosphere. The furniture is distinguished by its luxury and discretion. Garden Room - 35 sq.m. : Get sun kissed with natural sunlight in a colonial room with a garden view. Equipped with all the modern amenities, the room exuberates a charm that will make you fall in love again – with the resort as well as your partner. Beach Villa - 75 sq.m. : A private beach, outdoor patio and Maldivian showers – need we say more. The Beach Villas are a sight out of a picture postcard. After all, it’s not just a villa, it’s a celebration of the beauty of the ocean. 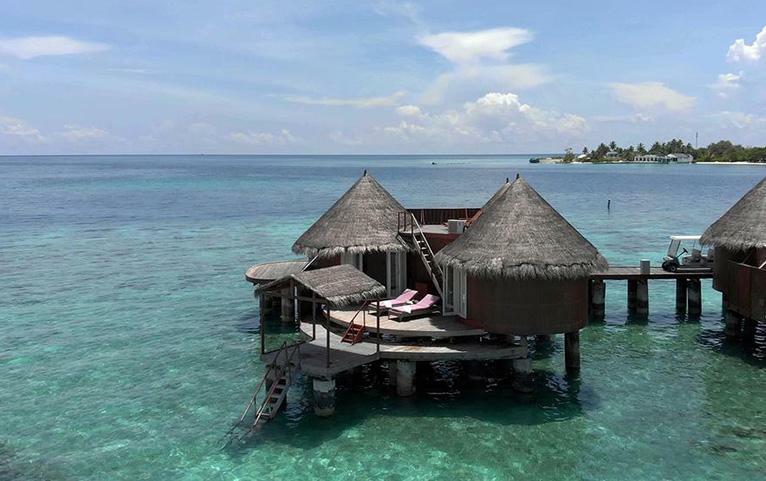 Water Villa - 75 sq.m. : A cozy waterfront villa is designed in true Maldivian style to tickle your senses whether you are a water baby or not. The self-contained waterfront villas are surrounded by coral reefs and the interiors reflect the local essence with coral blocks and palm leaves blended in the design. Maximum Guest Capacity: The maximum room capacity is two adults and one child aged below 12 years or three adults for Garden Room and Water Villa. 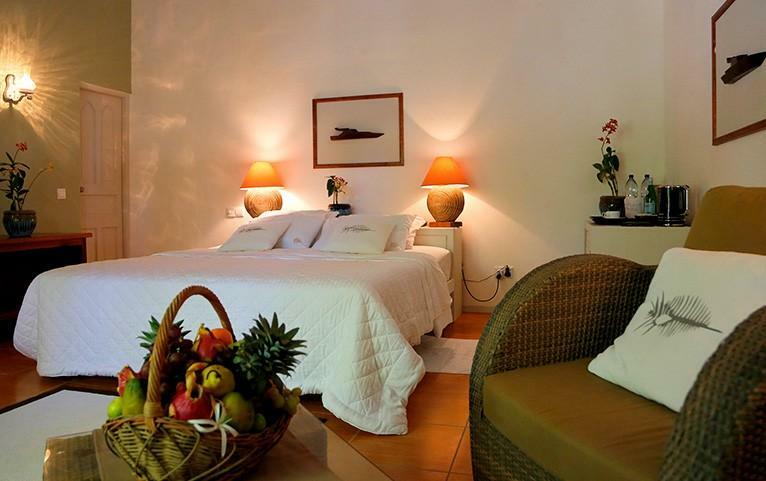 For Beach Villa the maximum room capacity is two adults and two children or three adults. See the ‘Extra Guest Policy’ and ‘Child Policy’ for more details. Extra Guest Policy: Where applicable, an extra adult can stay at a surcharge of USD 145 per night for the Garden room or USD 175 per night for the Beach Villa and the Water Villa, with an extra bed and the inclusions available in the package, payable directly at the resort. The return seaplane transfers must be booked separately, at an additional charge of USD 400 per adult. A green tax of USD 6 per person per night would be payable directly at the resort for extra guests. Child Policy: A child aged between 0-1 years may stay free of charge. Where applicable, a child aged between 2-12 years may stay at a surcharge of USD 85 per night, which includes an extra bed and the inclusions available in the package, payable directly to the resort. The return seaplane transfers must be booked separately, at an additional charge of USD 200 per child (between 2 - 12 years). A green tax of USD 6 per child per night would be payable directly at the resort. Restaurant Bar: during meal times. The timing may be changed upon resort’s discretion. All drinks will be served by the glass. Both alcoholic and non-alcoholic beverages will be served one at a time and cannot be ordered in advance. All types of beverages ordered at the Main Bar, Beach Bar/Coffee Shop or Restaurant Bar are for personal consumption only. Takeaway of all-inclusive food/drinks from bars or restaurant is not permitted. Services of Mini Bar are not included in the all-inclusive package except Drinking Water. The resort is not responsible for facilities or services that cannot be used due to unavoidable circumstances or adverse weather conditions. Billing of all food and beverages consumed, and all services availed is mandatory. Guests are requested to sign all the bills presented against the services provided by the resort. The benefit of the package is valid from 02:00 pm on the arrival date until check-out or check- out time 12:00 pm. Clients will not be able to claim for the benefits in case of delayed or advance transfers to the resort. Airport Transfers: Just to add a little more comfort to your stay, the resort arranges for your airport transfers on a seaplane. Return airport transfers are part of your FABgetaways package. In-Room Dining: Too lazy to step out of the room? In-room dining facilities are available, at a surcharge. Inclusions in your package have to be availed at pre-designated areas in the resort. Doctor on a call: Medical situation or discomfort? The resort has a doctor on call available to help you with both consultation and medication. Dining: The hotel has a restaurant that guarantees a trip of flavours throughout your stay with Italian, international and ethnic specialities served as a buffet lunch and à la carte dinner. The Coffee Shop: to enjoy background music with an unforgettable happy hour on a background of sunset and bursts of laughter. Bepi bar: right next to the restaurant, you can not miss it with its roof adorned with the hull of a dhoni, the traditional boat of the Maldives. Perfect for relaxing enjoying a free internet connection. Spa: The Lotus Spa offers an array of rejuvenating therapies from Ayurvedic to Balinese Massage. Other features: The resort spoils you for options with its luxurious Sauna and Swimming Pool. It has a well-equipped gym, sports facility for Volleyball and Table Tennis, PADI-certified Diving Centre. Nika also organizes excursions and water sports for its guests for a truly Maldivian experience. Either direct or one-stop flights from most major Indian cities are available to Male International Airport. Upon your arrival at Male International Airport, take a 20-minute seaplane journey to the resort - return seaplane transfers are included as part of your FABgetaways package.